Imagine a system where everyone had a right to basic material safety, and could say “no” to abuse and exploitation. Sounds utopian? In this article I argue that it would be quite feasible to get there, and that it would make eminent economic, moral, and political sense. The Earned Income Tax Credit (EITC) is the most progressive component of the current U.S. income tax code, redistributing income toward families with low (but not without) earnings. 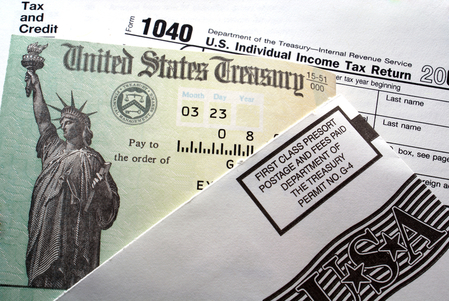 The EITC was first introduced in 1975 and was substantially expanded in the 1990s. In order for someone to be eligible to receive EITC payments, they must have paid employment but earn less than a certain amount. Additionally, EITC payments go mostly to households with children. The combination of two key features makes the EITC a popular program among policymakers. First, the EITC significantly reduces poverty among working families. Second, it also provides a strong incentive for unemployed people to seek work. But is a subsidy of low wage work, as provided by the EITC, really the best way to get money to people who need it? In a new working paper, I argue that it would be better to extend the benefits of the EITC to those who don’t have any income, rather than restricting them to low wage workers. Such a system could be based on an extension of the current EITC, providing transfers to those who don’t have any earnings, and then fading them out for households with moderate incomes. Such an extension would amount to a radical improvement of the lives of those at the bottom of the economic ladder, providing a basic safety net that would be available independently of the vagaries of life. It would provide an “outside option” that sets a floor to the conditions anyone has to accept, for material reasons, in relationships, jobs, or interactions with the government. In my paper, I discuss four sets of arguments why it would make economic, moral, and political sense to transition from the current system of subsidizing low wage work to a system providing an unconditional safety net. First, subsidies of low-wage work, such as an EITC, distort incentives; they cause people to work more than they otherwise would. Unconditional transfers would reduce the resulting inefficiency, so that there would be a bigger economic pie to distribute, and more money would go to those who need it. In the paper, I call this the “magic bucket”: the idea that by moving from a world in which we provide subsidies of low-wage work to one in which we provide universal transfers, we incur societal savings. As we reduce conditional (EITC) payments to support an unconditional transfer system, individuals work less, which leads to government savings from fewer and smaller EITC transfers. As a result, you can reduce EITC payments by less than $1 to pay for $1 of unconditional transfers. Second, subsidies of low-wage work depress wages. By providing incentives for people to work, such subsidies allow employers to pay less, so they are, at least in part, a transfer to employers rather than workers. Replacing subsidies of low-wage work with unconditional transfers would improve workers’ bargaining position and wages. I also argue that there are important moral and political considerations for unconditional transfers over conditional ones, such as an EITC. Unconditional transfers would increase individual liberty and would improve fairness. This sort of benefit would allow people in abusive relationships with domestic partners, employers, or government administrators to leave the situation without fear of material destitution. Unconditional benefits would also improve fairness by remunerating unpaid care work (particularly by women), civic engagement, and cultural production. Lastly, unconditional transfers that are conceived of as a universal basic income would be politically more sustainable and popular than narrowly targeted transfers. Universal benefits tend to have stronger democratic support than conditional benefits for the poor (think Social Security or Medicare). In summary, these arguments suggest that EITC benefits expanded to become a universal basic income would give more to those who need it, would promote liberty, and would be politically viable and stable. If one accepts these arguments, a political case needs to be made for a UBI. Any such case must grapple with and overcome distinctions drawn between the “deserving” and the “undeserving” poor. Such distinctions underpin the popularity of conditional transfers among politicians, but that underpinning has historically often been based on racial discrimination. A case for a universal basic income also needs to provide alternative narratives of a shared fate and shared interests, of a common defense of liberty, and of the valuable contributions of those working outside paid labor. https://usbig.net/wp-content/uploads/2019/01/23833101691_70b96c2011_o.jpg 301 449 Guest Blogger https://usbig.net/wp-content/uploads/2018/02/USBIG-logo-1.png Guest Blogger2019-01-23 20:45:352019-01-24 14:12:50Guest Blog: "The case for an unconditional safety net"